With individual on-off switches on almost every outlet, you can control which cords are hot or not. 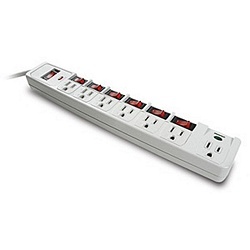 Use with our Power Strip Liberator cords (sold separately) to reign in energy-wasting AC adapters. Pros: I have several of these and find they are quite good. I have written a previous review to that effect. I did recently experience the master switch on one of them breaking after it had been in use for about 3 years, although I attribute its breaking to the fact that this particular one is given heavy use. Cons: Have used several of these for quite some time and while they are quite good, I did experience one switch breaking because of quite heavy use. Other Thoughts: Excellent surge protector and the individually switched outlets are fantastic for a lot of applicatrions! 2 out of 3 find this review helpful. Pros: This item fits the bill perfectly. It is very well made of heavy duty plastic. The 6 foot cord is nice and long. The switches have a nice click to them. 4 out of 5 find this review helpful. Pros: I've been looking for something like this for a long time! I use several sets of surround sound speakers attached to 3 different PCs/laptops in my home office. This surge protector makes it easy to switch various parts of the overall sound system on & off. A lot neater and more efficient than using individual plug-in switches in a power strip or surge protector to accomplish the same thing. Cons: Haven't found any. The one thing I'd really like to see is a larger version of this one with 10 outlets. Other Thoughts: This could be handy in any configuration of devices where you need/want multiple switches right next to each other for easier and quicker control. And the device switches themselves can be left switched on. I'm putting in laptop workstations in another area of the house and will probably buy a couple more of these as they are really handy gadgets! 3 out of 4 find this review helpful.